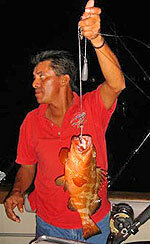 If you really want to fish for good eating bottom fish in Cancun, there is no better way than night fishing. Grouper, snapper, triggerfish, barracuda and even small sharks become even more active at night, making for some excellent fishing by moonlight. Even better - start a little early with a sunset cruise! Your boat is a luxurious 46' Hatteras, featuring air-conditioning, TV/DVD, a stereo system, a kitchen with a microwave, and of course a full restroom with a shower. She is a beautiful boat, licensed for up to 14 people, but there are only 6 fishing rods, so keep that in mind. We'll start our night fishing trip about 3:30 PM, and make our way to the fishing grounds using our state of the art fish finder. Fish, listen to music, or even watch a movie - all while enjoying a cool refreshment. Watch the lights of the Cancun hotel zone from the water, and fish the night away. After the trip, take your fish and have it cooked up for you! Passengers: Up to 14 people, but only 6 can fish at a time. Departs: Complimentary Pick-up from your Cancun Hotel. Add $50.00 for pick-up in Playa del Carmen or the Riviera Maya north of Playa del Carmen. Add $100.00 for pick-up south of Playa del Carmen. Pick-up in Playa del Carmen is at 2:30 PM.